Litigations in Indirect Taxes is complex and each Statute, namely Service Tax, Central Excise and Customs needs to be interpreted jointly with proper demarcation to its applicability. This book aims to help the Practitioners and Assessees in demystifying the complexity and address the challenges faced. 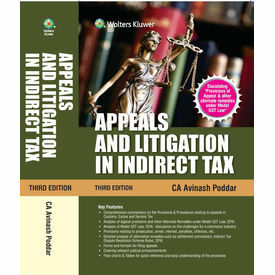 Appeals and Litigation in Indirect Tax, published by CCH (Wolters Kluwer), is a comprehensive book for Tax professionals, CA and Law students. It covers: provisions and procedures relating to appeals in customs, excise and service tax, principles of estoppel, res judicata, doctrine of merger etc., covering specimen forms, formats for filing appeal, and important case laws in respect of appeals. This book also discusses the provisions of appeals with the principles related thereto established through the different judicial pronouncements in detail. Also, the latest cases on several issues, subjects and principles are explained in each chapter, guiding readers about practical aspects like drafting of appeal, case hearing, how to obtain stay order, etc. before Commissioner (Appeals), CESTAT, High Court and Supreme Court. We are all aware that Model GST law, 2016 was released on 14th June 2016 in public domain; and now with the ongoing debate at the Parliament Monsoon Session which commenced from 18th July, 2016, roll out of GST is very much anticipated. The book covers the provisions pertaining to Appeals and Alternative Remedies under the Model GST Law and the provisions have been discussed in simple language for the readers. Provisions relating to prosecution, arrest, interest, penalties, offences, etc.